It’s the end of February! Time to reassess your New Year’s resolutions. 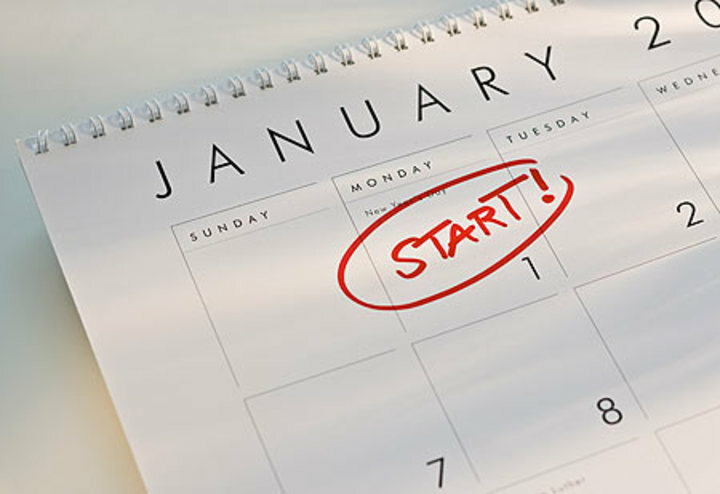 We ran a feature in our most recent newsletter about planning your goals for 2012. We wanted to help you plan in a way that will set you up for success over the course of the year. The end of February is the perfect time to evaluate what is and isn’t working and make positive adjustments to our goals! These adjustments can help get you back on track to achieving your organizational goals without abandoning them altogether. I recommend taking just 30 minutes of quiet time during a weekend when you’re more likely to feel calm, rather than during the week when you may already be anxious due to work and home duties. In that half hour, pick out the resolutions that are completely off track. Are they relevant to where you are in your life anymore? If not, it’s okay to remove them from the list completely. Let them go. If the goal is still one you’d like to achieve, leave it on the list. Remember to be realistic in how much time it will take to reach this goal and give yourself a little more time beyond that to get there. Reset your deadline and remember to work backward in setting your milestones. Check that newsletter for a crash course in doing this. What else? Check back in with your buddy! Let her know that you’ve reassessed your resolutions and the goals you’d like to achieve have changed a bit, but you’ll still need her support in getting there. Set weekly check-ins with each other. This is your year to reach your goals with diligence. 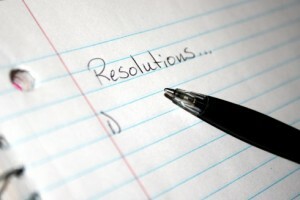 At the same time, be gentle on yourself by performing a resolution reassessment every so often. 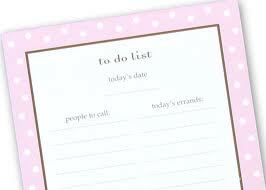 Readjusting your 2012 to-do list will set you up for continued success over the rest of the year. Priorities change, and so should your goals! 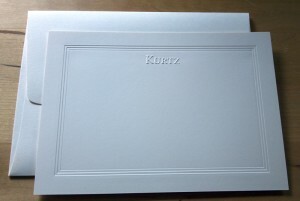 Recently, I ordered two new sets of personalized stationery and an address stamp, and it struck me that I should share the process with my readers. Not only is having your own stationery a small way of showing care for yourself, but it also shows your recipients that you think they are special. After all, there is nothing more personal and thoughtful than a handwritten note. I am crazy about stationery and always have been. In my pre-WOW years, I even collected too much of it! I had note cards of every style, shape and size. As I began my transformation to a well-organized life, I realized that I didn’t need so much of a variety, but instead wanted something a little more personal. I’ve heard similar stories from many clients who, as they discovered the well-organized woman within, made the choice to free themselves of quantity and opt for quality. To create a streamlined, organized and simple stationery wardrobe, you can start small with a set of correspondence cards, fold-over notes (informals) and envelopes. 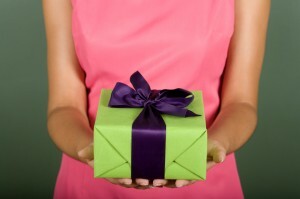 Personal Set: Allow yourself one set that is just for you for personal notes, thank you notes, notes of sympathy, etc. I’ve included pictures of my choice for my own personal set. Family Set: A set for you and your partner or family is optional but often appropriate. It can be perfect for thank-you notes and attaching to gifts from the family or the two of you. If your spouse does not want his own stationery, a family set with just your last name initial is easy for him to use, as well. I’ve also included a photo of my family set choice. 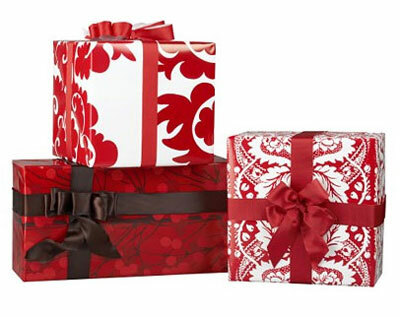 Gift Enclosures: I ordered gift enclosures with my new set of stationery. They are usually the size of a business card, come with a corresponding envelope and are perfect for tucking into a gift. Materials: For fine stationery, choose cotton paper. For informal stationery, any material is appropriate. Color: The most common paper colors are white and cream, but choosing an unexpected text color, border or embellishment to express yourself is one of the pleasures of selecting your personal stationery. 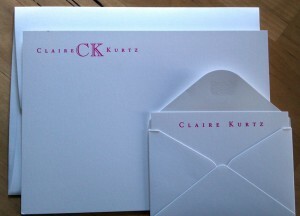 Layout: Your name and/or monogrammed initials can be the central image of your stationery, while your address should be printed on the back of the envelope. 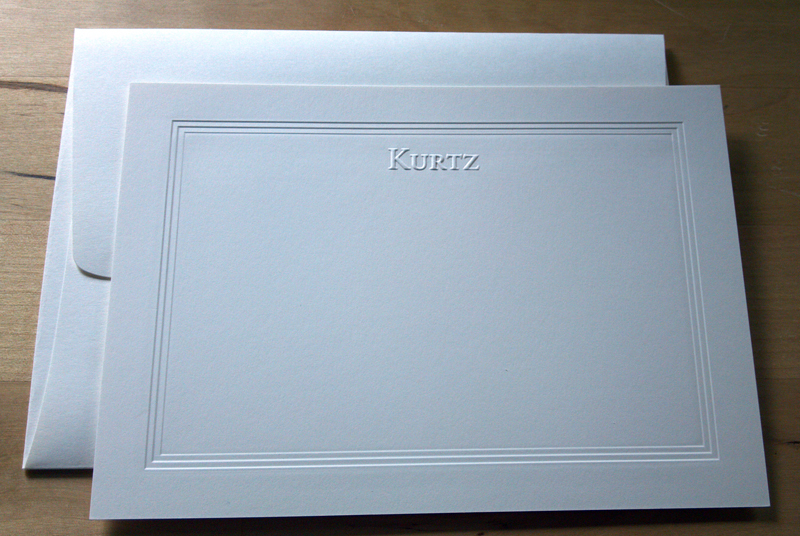 You can also opt for an address stamp or personalized embosser, instead. I chose to print our address for my family stationery and to use a fun address stamp for my personal set. After choosing your signature stationery, make sure to designate its place in your home office or bedroom. Keep pens, stamps, tape, embosser, and address stamp in the same place, as well, so that dashing off a quick thank-you card or writing a note of sympathy is not a time-consuming process. Remember, the point of being well-organized is to move through your life smoothly and easily. You want to be prepared but not over-stocked. I have been taking advantage of Groupons offered by Paper Affair to order my new sets, but there are myriad places to order stationery to fit every budget. Atlanta favorites include Paces Papers and Bumblebee Press. Two online companies with beautiful options are Delphine Press and Dauphine Press. All of these books have crept into my collection over the years. They are great resources to explore the traditional rules regarding building and using a stationery wardrobe. Each book gives a nice bit of guidance on crafting appropriate written correspondence. As we become an increasingly informal society, it is a pleasure to engage in the social arts that fall by the wayside! As a follow-up to our last post, Pack it Up, Pack it In, it seems only fair to address a piece of luggage that is near and dear to every woman, every day — her handbag! A woman’s purse can be a form of self-expression and creativity, yet it can also be one of the most disorganized areas in her life. Personally, a messy bag makes me feel, well, messy! Stress and discombobulation creep into my day when I cannot find what I need, when I need it, in my purse. And what woman has time for that?? Below are our tips for keeping your handbag beautiful, organized and efficient. When your purse works perfectly for you and your lifestyle, your image gets just the boost it needs to get you through your busy day with confidence…read on! 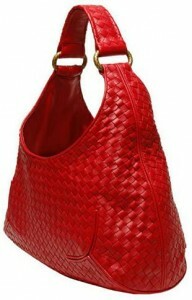 *The key is to “re-set” your Wicker bag round each night so that you can pick up and go every morning. You can make this a nightly ritual, so that it feels like a special activity that is just for you. Remove receipts and used napkins, corral loose change, replenish business cards, medicines and tissues. Make sure your lipgloss, wallet, keys and mints are in the bag, as well — you don’t want to be caught without these important items. Remove your or your kids’ half-eaten snacks and re-stock those items if needed for the next day. Wipe down your bag with a soft cloth – it was an investment, so treat it with care. *I often find it helpful to change bags every few days. Try it. You’ll feel like you’re making more of an effort with your wardrobe choices and you’ll be forced to constantly reevaluate what goes into the bag, what goes into the trash and what goes back on the shelf. 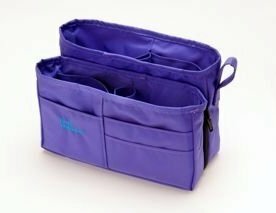 *Use a bag organizer like the Purse Perfector – it has many pockets for everything you need to carry, and you can easily remove it and place it directly into another bag or tote. *Create a list of the items that are allowed in your bag, and stick to the rules. *Assign designated areas that are easy to reach for each of your most important items. Cell phone in phone pouch (most bags have them now). Lipgloss, keys, pen and business -card holder in interior pocket. Wallet in large bucket of purse, makeup bag, notebooks, flat shoes, etc. in the main pouch of the bag. Receipts should have a designated area, as well, but make sure to clean that out every 2-3 days. Paper and wrappers are one of the biggest sources of handbag clutter for me! Go paperless! Use a calendar app for your phone instead of carrying a paper planner or use a notes app instead of carrying an extra notepad. If you commute on public transportation, decide whether this is a music day or an e-reader day and choose which item you’ll take in your bag. Don’t weigh yourself down with both. And lastly, here’s a list of recommended items to fill your bag. Enjoy the power of the purse! The Well-Organized Woman talks about prepping and organizing your home for the holidays in Atlanta INtown newspaper this month. 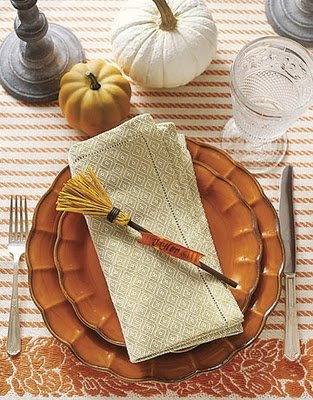 Check out the article for ideas on getting ready for entertaining and creating a calm, organized living space!